The AP Studio Art course earns honors credit and is considered a college-level course of study offered to juniors and/or seniors. Students follow the guidelines of the College Board and meet the TAS expectation for AP and IB courses. 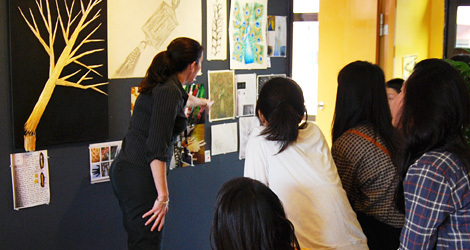 During this year-long course, students work to complete one of three portfolio options: Drawing, 2-D Design, or 3-D design. AP Studio Art students should be prepared to do a significant amount of work outside of regular class time either after school, during free periods or at home. critiques, and opportunities to exhibit work are all features of this course that contribute to the development of a successful portfolio. Drawing Portfolio: The Drawing Portfolio addresses a very broad interpretation of drawing issues and media. Students demonstrate mastery of light and shade, line quality, rendering of form, composition, surface manipulation, and illusion of depth are drawing issues that can be addressed through a variety of means, which could include painting, printmaking and mixed media. 2-D Design Portfolio: The 2-D Design students demonstrate mastery through any two-dimensional medium or process including, but not limited to: graphic design, digital imaging, photography, collage, fabric design, weaving, illustration, painting, and printmaking. 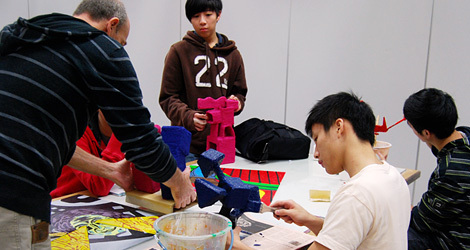 3-D Design Portfolio: This portfolio addresses sculptural issues and involves purposeful decision making about using the Elements and Principles of art in an integrative way whereby students demonstrate their understanding of depth and space.